It began as a twenty-page monologue written by Evelyne de la Cheneliere. 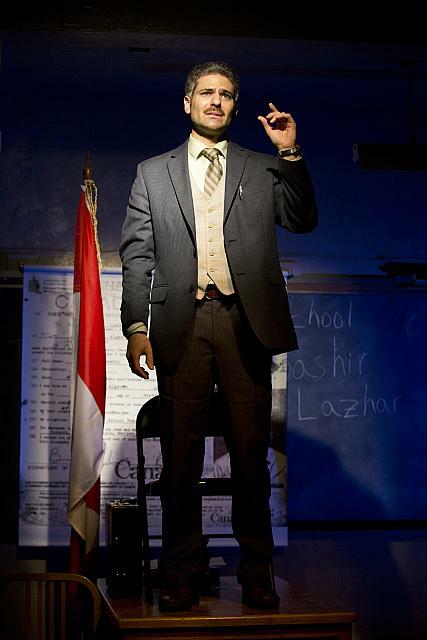 Later, it would become an Academy Award-nominated film and now “Bashir Lazhar” is a one-man, 80-minute play. The story tells of a French-Algerian political refugee finding solace and escape from unspeakable horror and sadness in a Canadian elementary classroom. M. Lazhar, portrayed with bravado by Juri Henley-Cohn, is not a professional teacher. Rather, he attempts to become an educator, intent on finding a way to start over and help his new students while healing from the traumatic event that led to his employment. The story he tells unfurls in its own time, perhaps too slowly for a one-act play. “Bashir Lazhar,” directed by Shakina Nayfak, begins a conversation about the constructs that attempt to define citizenry, education, war, and what happens when those worlds crash together. In this tiny microcosm, we see a single man try to come to grips with what has happened to his life while attempting to instill in his students a love of life, play and learning. If the length of the play wasn’t already a hurdle, Mr. Henley-Cohn was also tasked with set changes. A risky choice and one that doesn’t always work well and ultimately detracts from the final moments of the play. Watching the actor side-step set pieces inexplicably left strewn around the stage from an earlier scene distracts the audience. Attempts at unique lighting and sound cues to signify scene changes worked well enough, but at times, the play seemed more of a staged reading than complete production. It’s too bad this was the case; the story and the actor deserved more than creative cheats by the lighting and sound designers. What the play doesn’t do is tie it all up in a lovely bow by curtain call. It opens the door and asks the audience to come inside and reflect on what it means to be a teacher, a student, and a citizen of any country. It reminds us that we are all three in our daily lives but nothing is more important than remembering to carry a light in ourselves, that a do-over isn’t always as easy as wiping a chalkboard clean, but it is always a possibility.